Aricept tablets contain the active ingredient donepezil hydrochloride, which is a type of medicine called an acetylcholinesterase inhibitor. Acetylcholine regulates the memory process inside brain. Donezepil works increasing the level of acetylcholine in the brain and slowing down the breakdown of acetylcholine. This improves cognitive processes and the symptoms of dementia. Aricept is used to treat the symptoms and improve the daily functioning of people with Alzheimer’s disease. Symptoms of Alzheimer’s disease include day-to-day memory loss and confusion. A person with Alzheimer’s may also develop odd, uncharacteristic behaviours. Aricept reduces these symptoms. Aricept tablets are known as ‘orodispersible tablets’. They are designed to disintegrate on the tongue in the saliva and then be swallowed either with or without water. If you have forgotten to take a tablet, do not take an extra tablet to make up for the forgotten one. Just skip the dose and resume your regular schedule the following day. Do not discontinue the treatment without consulting a doctor. Aricept is only suitable for use in adults. 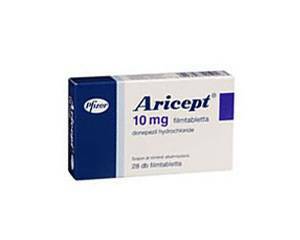 Aricept is a prescription-only medicine that comes in tablets of 5 mg and 10 mg. The recommended maximum daily dose is 10 mg. Aricept tablets should be taken in the evening before going to bed. Do not exceed the prescribed dose. See the package leaflet for a full list of side effects and information on interaction with other medicines. Aricept should not be used in people who are hypersensitive to donepezil or any other ingredient in this medicine. See the package leaflet for a list of all the ingredients in Aricept. If in doubt, consult a doctor prior to use. People who have or have had ulceration or bleeding in the stomach or intestines, liver problems, asthma, epilepsy or urinary problems should not use this medicine without consulting a doctor. Aricept should also not be used in people with a severe liver disease. Do not use this medicine without consulting a doctor if you are pregnant or trying for a baby. Women who are breastfeeding should not use this medicine. Aricept can cause fatigue, dizziness and muscle cramps. Stay out of traffic and do not operate potentially hazardous machinery if you experience any of these side effects. Alcohol may impact the effectiveness of Aricept and therefore should not be consumed while taking this medicine.